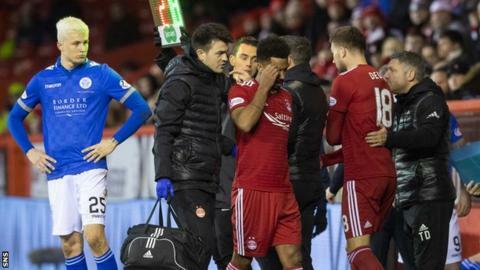 Aberdeen full-back Shay Logan could miss the rest of the season with an ankle injury, says Derek McInnes. The 31-year-old limped off in the Scottish Cup win over Queen of the South this month, and needs surgery. McInnes is considering bringing in a free agent to provide defensive cover for the Englishman, as well as Tommie Hoban, who is out for the season. "It will be touch and go if we can get him back before the end of the season," the Aberdeen manager said. "We will look to maybe try and bring in another defender on the out of contract list. We were hoping we might be able to him manage him through to the end of the season but on Thursday afternoon it became clear he needed some work done." Logan has been a regular for Aberdeen since initially signing on loan from Brentford for the second half of the 2013/14 season, before signing permanently that summer when his contract expired. He has made over 160 appearances for the Pittodrie club, 31 of which have come this season.